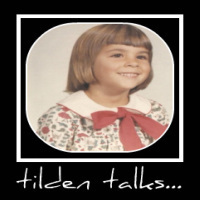 tilden talks...: Business Card Magnets - What's On Your Fridge? My good friend Tammy makes and sells cake. She has a frightfully delicious recipe and everyone who tastes it raves. She also makes a great buttercream frosting. But Tam's real talent is the design and execution of cake for special occasions. She can create a traditional or custom cake for any wedding, birthday, anniversary or holiday. Tam can make you a cake for any occasion, just tell her the specs and she will go to town. Tammy's cake gets a lot of compliments. Tam and I were discussing ways to market her cake business. She already has very nice cards she passes out, but she's afraid the card may get mislaid or thrown away before a person needs a cake. I suggested business card magnets. A business card stuck to a fridge would stay around much longer than a paper one floating about in a purse. As we discussed it, her son and his girl joined us. They are a very cute couple and we teased them about wedding plans. They very seriously told us they have none. Son pointed out that cute-ness does not a marriage make. Girl pointed out that the party they planned to attend would be a great opportunity to hand out business card magnets. Tam wondered where these particular party goers might stick the magnets. Keg or can? I have been considering business card magnets. That would keep my Avon number right out in sight and on everyone's mind for sure.